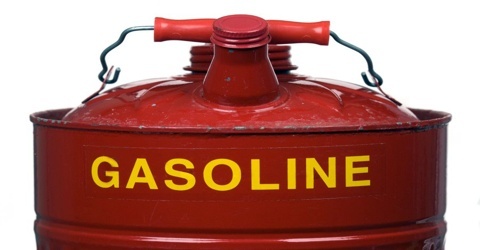 Gasoline or petrol is a highly flammable mixture of liquid hydrocarbons that are derived from petroleum. It is derived during fractional distillation process and has a translucent liquid form. The hydrocarbons in gasoline contain between five and eight carbon atoms. 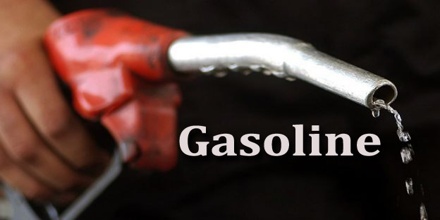 Gasoline is used as a fuel for internal-combustion engines in automobiles, motorcycles, and small trucks. It consists mostly of organic compounds obtained by the fractional distillation of petroleum, enhanced with a variety of additives. Gasoline is made up of molecules composed of nothing but hydrogen and carbon arranged in chains. Gasoline molecules have from seven to 11 carbons in each chain. The characteristic of a particular gasoline blend to resist igniting too early, which causes knocking and reduces efficiency in reciprocating engines, is measured by its octane rating. It is produced in several grades of octane rating. 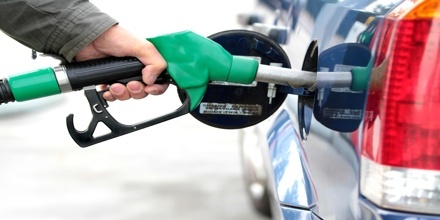 Originally a by-product of the petroleum industry, gasoline became the preferred automobile fuel because of its high energy of combustion and capacity to mix readily with air in a carburetor. It may also enter the environment uncombusted, as liquid and as vapors, from leakage and handling during production, transport and delivery, from storage tanks, from spills, etc. The gasoline manufacturing process begins with the crude oil from which the gasoline is extracted, and ends when additives have been placed into the fuel. Gasoline was at first produced by distillation, simply separating the volatile, more valuable fractions of crude petroleum. 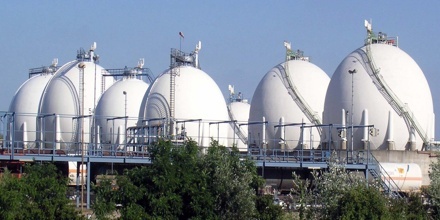 Later processes, designed to raise the yield of gasoline from crude oil, split large molecules into smaller ones by processes known as cracking. Gasoline is a complex mixture of hundreds of different hydrocarbons. Most are saturated and contain 4 to 12 carbon atoms per molecule. Gasoline used in automobiles boils mainly between 30° and 200° C (85° and 390° F), the blend being adjusted to altitude and season. Aviation gasoline contains smaller proportions of both the less-volatile and more-volatile components than automobile gasoline. Once the crude oil arrives at the refinery, the next step in the gasoline manufacturing process is refining it. The extraction process uses distillation to break crude oil down into different distillates and fuel is one of them. When the vapor reaches about 150 degrees Celsius, the hydrocarbon chains that make up gasoline begin to move into liquid state. The gasoline begins to collect on the distillation plates and gets siphoned off into a holding tank for the next step of the manufacturing process. Majorly all around the world gasoline is used as fuel for vehicles. It’s one of the main products, which is consumed heavily worldwide. The US is the biggest consumer of gasoline all over the world, where nearly 45% is consumed. They have highest usage rates per person. Other major consumers are Britain, China, Japan and India. The US is also the largest refiner in the world. Other major countries are also in the refining business, but all is consumed within those countries itself. Petroleum companies include other additives to give consumers better performance and to differentiate their gasoline from other companies on the market. Once the gasoline has all the required additives, it is ready for the retail fuel market. Reference: britannica.com, dictionary.com, economictimes.indiatimes.com, wikipedia.